Himachal Pradesh is full of incredible destinations and offers diverse sceneries to its visitors. While navigating through the splendid landscape of Spiti Valley, I stumbled at the picturesque hamlet of Langa. 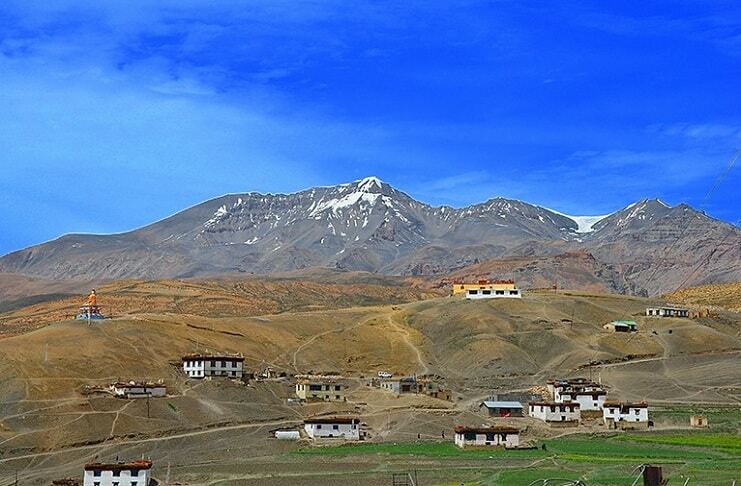 Spiti Valley is full of isolated villages blessed with ancient monasteries and remains of prehistoric life but there are few villages those will awe-struck its visitors and leave them speechless wandering about the magic of nature. Langza is certainly one of those! Set amidst the green pastures surrounded by snow-clad mountain, the village of Langza is primarily dominated by the statue of Lord Buddha overlooking the valley and an ancient monastery. Langza village situated at an altitude of 4400 meters is divided into 2 sections, namely Langza Yongma (Lower) and Langza Gongma (upper). This homogeneous Buddhist village belongs to the Sakyapa sect of Tibetan Buddhism. Langza house a population of 137 in 33 households. The mainstay of this village in the olden days was mud craft. Vessels of all shapes and sizes were produced here and supplied to the entire valley for household use. This craft has dwindled over the ages and the current mainstay is primarily to agriculture, the village is adorned by an ancient Lang (Temple) estimated to be around 1000 years old. The Lang is regarded as the headquarters of all the Devtas (deities) of the Spiti Valley. Life is not always blossoming in such a hostile terrain. Summers are the salubrious season for marking and gazing the sheep. Winters are long and inclement at Langza. Langza remain disconnected from the civilization during winters; only a few brave souls stay in their mud house during that inhospitable weather. As summers arrive, the transformation of snow fields to green pastures is truly overwhelming and Langza opens its door for few fortunate visitors. Other than visiting the monastery and mud houses of the village, travellers can also take the trail to few high altitude lakes and even try to accomplish any peak around Langza. Fossils of Marine animals which are found in the vicinity of Langza village lure many geologists and anthropologists each year. I enjoyed the absolute solitude of strolling around Langza village which is very rich with fossils of Marine animals and plants those were here millions of years ago and it presented me a glimpse of the prehistoric era when Spiti was submerged in the Tethys Sea. Though I spent significant time at Langza but I left it with frowning curiosity of missing something. Those dotted mud shelters in the middle of wide pasture of silent colors still in my dreams and temple me! This is an exclusive travelogue written by Mr. Vishnu Kumar, an ardent traveller and writer absolutely in love with Himachal Pradesh. Incessant curiosity about life in different geography of India drives his wanderlust and he continues to explore, forever! In between earning degrees, switching cubicles and listening to conformists, he has always imagined about travelling and is lucky enough to realize his dreams too. Life on the road has been extremely enriching for him and he writes his travel experiences with an aim to help fellow travellers in exploring places.